FBS leads pack on Overall End-User Satisfaction. Marketlinx slips. Rapattoni and LPS make gains. 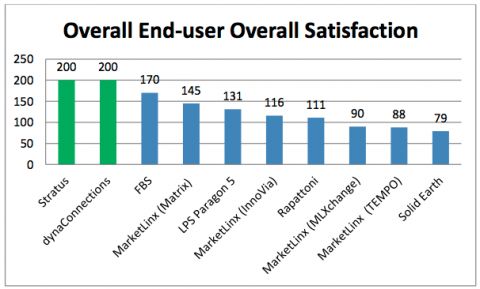 FBS beat it second place rival Matrix MLS system (now owned by Marketlinx) in the “Overall End-User Satisfaction” by a wide margin (170 to 145). The annual survey, released today, was conducted by Clareity. Both Rapattoni and LPS made gains in overall customer satisfaction from previous years. I think the story being told her is pretty obvious. FBS without the distractions of acquisitions, multiple platform support and leadership drama has been able to focus. That focus is a win for their customers. Marketlinx’s problem is loss of focus. They just acquired Martix last year, that made it a total of 5 different MLS systems they need to support (if you count Fusion). Aye caramba! The stretch of resources is beginning to show in other areas such as the recent stability problems of their new Flash based Reallist tax system. Rapattoni after surviving a rough patch last year seems to found some stability. After divesting themselves of the broker agent division (now called RED) and implementing a successful migration to Paragon 5 it seems LPS has also looking ahead. It will be interesting to see how reInsight is received in the market. I like the approach Clareity took this year with the survey. They added much need context to the data instead of a bunch of charts and graphs. You can check out full survey here. It’s important to note that the survey is a snapshot in time – Corelogic may be very successful in moving “legacy” MLXchange and TEMPO customers to its new Fusion platform. Also, Solid Earth still has a lot of customers that are raving fans and are hopeful that the new “Spring” platform will rocket Solid Earth into a leadership position again. My company is third or fourth? and behind Realist? And a county site? WTH? Ouchy! Apparently the pollsters missed the Arizona disaster or maybe they are just surveying the wrong people…..
Bill, the survey was January and early February and you are referring to an incident in March. Want to know why you didn’t do well? Talk to your own customers, and to Joel – I sent him the commentary. Is the survey sent out to all Realtor’s or Realtor’s in Leadership roles? And I do talk to my customers. Every single day. Bill, the survey is sent to your *MLS* customers – those in leadership roles. I perform *Realtor* surveys all the time as well. I’m sure you talk to your customers all the time – why a smaller percentage rated your organization well than competitors’ did, I don’t know – other than the specifics I sent to Joel. I always enjoy participating in and reading the results of these surveys. Thank you to the people at Clareity for doing this every year. To Bill Rovillo I would say, remember that this isn’t science. I believe the real value of the survey is not in the rankings, but in the commentary provided by the customers. This survey shouldn’t sway the decision making process when choosing a vendor, but it certainly provides insight into questions an MLS might want to ask when interviewing vendors. As a customer of Rapattoni I want to say congratulations on an excellent year. The gains were certainly earned. It seems like they are getting a little bit of their mojo back.